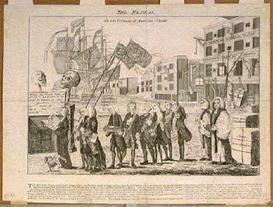 As colonists settled in America, they needed to decide on how to govern themselves. Shortly before the Mayflower landed at Plymouth in 1620, the ship's passengers signed an agreement known as The Mayflower Compact in which they set forth their understanding on how the Plymouth Colony would be governed. After the English Revolution of 1688 brought William of Orange and Mary to the throne, Oxford philosopher John Locke published his Two Treatises of Civil Government. Locke's theory of natural law and natural rights argues that all men are created equal by God in the "state of nature," and that they can give up their rights only by consent granted to their rulers in order to protect and advance their lives, liberty, and property. Since the social contract through which people conditionally transfer some of their natural rights to the government exists only through consent of the governed, Locke contended that tyrannical governments which fail to protect basic rights can be resisted and replaced with new governments through revolution. Locke's ideas had significant influence on the colonial leaders later arguing for independence from Great Britain, and are reflected in the language drafted by Thomas Jefferson in the Declaration of Independence justifying the Revolution. 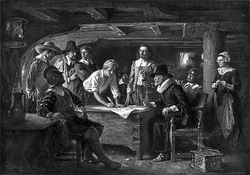 In addition to the agreements entered into by settlers on how they would govern their settlements illustrated by The Mayflower Compact, some of those receiving grants of land from the Crown established colonial governments through written charters. Sometimes issued to encourage settlers to take the risks of moving to the New World, these documents often included guarantees of such rights and liberties as due process of law, taxation only by vote of representatives and religious freedom. They later evolved as key sources for the legal and political arguments leading to the Revolution. One example was the 1677 Concessions and Agreement of the New Jersey colony in which the colony's proprietors agreed, in an attempt to encourage settlement, to provide religious freedom and limited self-government. Nearly a century later, as tensions increased in the years before the Revolution, colonists claimed that the violation of these rights justified rebellion. In 1768, after the British sent two regiments of soldiers to Boston, they were greeted by protests from the colonists over the existence of a "standing army." The soldiers were frequently harassed, indicted by local courts for minor violations and heckled on the street by citizens. On March 5, 1770, a crowd gathered at the Customs house and began throwing snowballs and taunting the soldiers. One soldier was knocked down and fired into the crowd, later resulting in further shots which killed five and wounded eight persons. The soldiers involved in the massacre were charged with murder and represented by lawyer John Adams, who argued at their trial that the soldiers were provoked by a "motley rabble of saucy boys, Negroes, mullatoes, Irish teagues and outlandish Jack tars." All were acquitted except two, who were convicted of manslaughter, and escaped execution by invoking a medieval benefit for those who had some biblical knowledge and were sentenced to being branded on their thumbs. 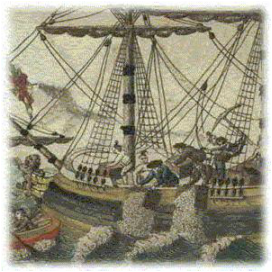 The Tea Act passed by the House of Commons on April 27, 1773, was regarded in America as a strategy to induce the colonists, by lowering the price of tea, to consume more of it and therefore acknowledge the principle of British taxation. 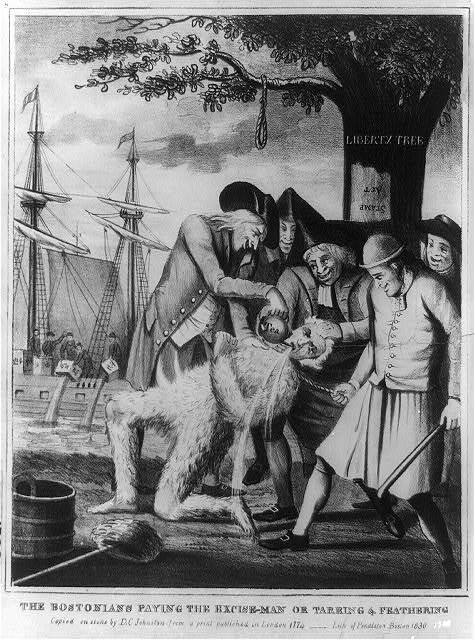 On December 16, 1773, a group of Bostonians disguised as Mohawk Indians boarded the tea ships docked in Boston Harbor and dumped all 342 chests into the water, provoking Parliament to enact harsh retaliatory legislation, known as The Intolerable Acts. Twelve of the thirteen colonies, with only Georgia absent, sent a total of fifty-six delegates to the First Continental Congress which met in Carpenter's Hall in Philadelphia from September 5 to October 26, 1774. One accomplishment of the Congress was the Association of 1774, which urged all colonists to avoid using British goods, and to form committees to enforce this ban.